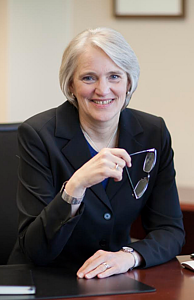 Dr. Paula J. Carlson began her duties as Luther College’s 10th president July 1, 2014. Dr. Carlson is a 1976 Phi Beta Kappa graduate of St. Olaf College. She holds an M.A., M. Phil., and Ph.D. in English and comparative literature from Columbia University. She has taught at the University of Dubuque, Yale University and St. Mary’s College in Notre Dame, Indiana. Prior to becoming Luther's president, Carlson served as vice president for mission at St. Olaf College. She also held positions as vice president and liaison to the St. Olaf College Board of Regents, and director of the Wendt Center for Character Education and associate dean for academic affairs at the University of Dubuque. Carlson’s leadership and administrative responsibilities for St. Olaf included the college’s current strategic plan, initiatives to enhance professional development opportunities for staff and faculty, and initiatives to expand the college’s programs and services for students as they discern their vocations and prepare for their careers. She led the successful re-accreditation process, 2009-2013, in which St. Olaf was one of 14 colleges and universities invited to participate in the Higher Learning Commission’s demonstration project to develop a new model for accreditation. At the University of Dubuque, Carlson led the development of the Wendt Center, which includes interdisciplinary curricular and co-curricular programs in ethics and character formation in the college, graduate school and seminary. She administered a new college core curriculum, coordinating course planning, course and program assessment and faculty development for interdisciplinary components. Her husband, Rev. Dr. Thomas Schattauer, is professor of liturgics and dean of the Chapel at Wartburg Theological Seminary. They have two children, Peter Schattauer and Anna Schattauer Paille. Read the college's strategic plan for 2018-2023. View a document that details the priorities and initiatives for Luther College. Office of the President maintained by Sally Ming. Page last updated on 21 May 2018.